Whether you're a shop, hotel, restaurant or caterer, we'd love to talk to you. But first of all, we'd like to tell you that our The Fine Cheese Co. branded products are exclusive to the independent trade. Whether you're Fortnum & Mason or the local corner shop, whether you're a Michelin starred restaurant or a neighbourhood bistro. 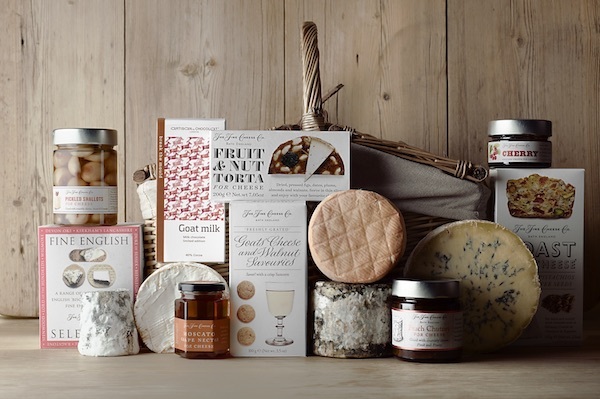 We offer a range of products – and artisan cheese of course. We specify the cheeses we want directly with the cheese-makers, who select them for us. We collect British artisan cheese from the farms, and mature it appropriately. Similarly, we import cheeses from France weekly, and from Ireland, Italy, Spain and Holland every two weeks. We always have the entire range (including catering packs where available) of The Fine Cheese Co. partners for cheese: Crackers and Biscuits, Fruits and Whole Fruits, English Pickles and Chutneys, and Pickled Onions and Shallots...and The Fine Cheese Co. Savouries, made with only freshly-grated cheese in stock. Sweet Biscuits: Elegant & English, Short & Sweet, Two by Two, My Favourite Bear and Butterflies. Cookies: The Fine Cookie Co.
We have French, Italian and Spanish artisan charcuterie that we import directly. We are the exclusive domestic distributors of Artisan du Chocolat, Van Nahmen nectars and juices, Bodrato chocolates, Tartuflanghe truffles and more. We offer a personal and tailor-made service for cheese. You’re welcome to come to our shop in Bath, London, or our Warehouse shop near Dyrham, spend time tasting cheese and pick up the tricks of the trade that we’ve learned over the last 20 years. We work together to find the best selection of cheeses for where you’re based, for the space you have, and for the customers you wish to attract. We let you know what’s coming into season, and what’s particularly good at that time. We give you full notes on every cheese you take, and, if you want, we can also supply you with shelf cards, weights, straw mats and wrapping paper. We are in contact regularly, just to make sure that everything is running smoothly, but, at any time, we are on hand to answer your questions, and solve your problems (preferably cheese-related!). We select and mature cheese, so as to make sure it reaches your customers in prime condition. We stock over 150 cheeses: British, and, imported directly, French, Irish, Italian, Swiss, Dutch and Spanish. They are all ‘artisan’, and they include, of course, all the ‘artisan’ winners from the British Cheese Awards, sofi and World Cheese Awards - some that are familiar names and some that are exclusive to us.